We believe in our solutions. We know they work because they have been thoroughly tested. We know that they will help prevent criminals from forcibly entering your home because they have been used to successfully protect thousands of homes. If a criminal were ever were to kick in a door, reinforced with one of our solutions, we will pay your homeowner’s deductible (up to $500 for Door Armor MAX or $300 for Door Armor MINI). It’s that simple. We don’t just talk the talk, we walk the walk. All of our products come with a 100% satisfaction guarantee. If you are not satisfied with our products for any reason, simple return them within 90 Days for a full refund. Armor Concepts will pay return shipping in situations where the return is the result of a manufacturing defect or shipping error. The customer will be responsible for return shipping in all other circumstances. That’s why we’ve designed Door Armor to integrate with more than 95% of the doors on the market. Within 30 minutes you can have the ultimate door reinforcement installed on your exterior doors, protecting your home and family. We offer our products at a price point that allows everyone to afford premium security. No monthly fees, no difficult contracts, just the best physical security money can buy. We’ve refined our engineering over the past 12 years, creating a product that is easy to install while making your door virtually impossible to kick-in. Our innovative designs feature patented technology that ensures their superior functionality. Not only have we made a rock-solid product, but we also made it right here in America. We are based in Nashville TN and embrace the bold idea that American manufacturing isn’t dying, its just getting started. Not a single one of our competitors offers anything close to what we do. Our guarantee, product breadth, rock solid American made manufacturing and patented technology sets Armor Concepts head and shoulders above the rest of the crowd. As with all products requiring installation, to reduce the possibility of accidental injury to you or other accidental damage, FOLLOW ALL INSTALLATION INSTRUCTIONS contained herein accurately and carefully. The goods sold hereunder are fit and merchantable for the ordinary purposes for which such goods are used and Seller warrants the goods sold hereunder against defects in material and workmanship as long as it is in the possession of the original purchaser. This warranty is offered to the original Buyer of these goods and valid proof of purchase shall be required. No extended warranty is offered or implied. In addition, Seller guarantees product against failure as long as it is in the possession of the original purchaser. If the purchaser’s home is burglarized during that period, due to a direct failure of Door Armor, Armor Concepts will pay the purchaser’s homeowner’s insurance policy deductible (up to $500 for Door Armor Max and $300 for Door Armor Mini). Direct failure of this product under this warranty shall be limited to the following: i). Entry into the home as a direct result of a door, equipped with a correctly installed product, being kicked in or forced open with direct blow to the face of the door by a body part; or ii). Entry into the home as a direct result of the product breaking or doorjamb splitting. Entry into the home through methods such as prying, cutting, use of heavy machinery or due to the lock or deadbolt breaking shall not constitute failure of this product for the purposes of this warranty. Entry into the home from an area of the door, not reinforced with the product, does not constitute failure for the purpose of this warranty. This warranty shall be void if entry is forced by the Fire, Police, EMS departments or any other government agency. 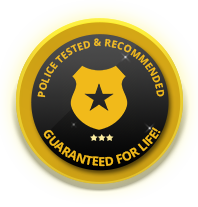 The Seller reserves the right to request from Buyer a copy of any relevant police and/or other reports that must be filed in conjunction with the direct failure of the product and/or any resultant warranty claim. Seller’s liability hereunder shall be limited to the lesser of the above-stated warranty ($500 for Door Armor Max and 300 for Door Armor Mini) or the cost of replacement of the goods. Buyer agrees that Seller shall not be liable for any consequential losses arising from the purchase, installation, and/or use of. Any use of this product in any manner other than intended or in conjunction with illegal activity by the user shall also void this warranty. Seller’s liability hereunder shall be conditioned upon the Buyer’s installation, maintenance, and service of the goods in strict compliance with the written instructions and specifications provided by Seller. Any deviation from Seller’s instructions and specifications or any abuse, neglect, or rental use of the goods shall void Seller’s warranty. In the event of any claim upon Seller’s warranty, the burden shall be upon Buyer to prove strict compliance with all instructions and specifications provided by Seller. The Seller reserves the right to request an on site inspection of all goods for which a warranty claim has been filed. Upon request by the Seller the Buyer must provide the opportunity for the Seller to inspect all goods in place as they had been installed originally. In the event the Seller declines the on site inspection option, the Buyer will be responsible for ensuring all goods for which the claim is being filed are returned to the Seller.